Keto Breakfast Eggs - Spanish Style Oven Baked - High Flavor, Low -Carb! 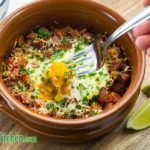 Whether you’re having breakfast, brunch or brinner (breakfast foods for dinner) our tasty Low Carb Spanish Baked Eggs will dance on your taste buds, fill your belly and keep you satisfied. Place the olive oil in a non-stick frying pan over medium heat. Add the diced chorizo, paprika and cumin and sauté for 3-5 minutes until the chorizo is cooked though. Add the diced tomato and continue to cook until the tomatoes are very soft, about 5 minutes. Add the roasted peppers, salt and pepper and mix through. Take the pan off the heat and evenly spread the mixture into 2 oven safe dishes. Make a hole in the center of the mixture and crack one egg into each dish. Sprinkle over the manchego cheese and parsley. Place the dishes into the oven for 5-10 minutes until the egg is cooked to your liking.